In one of the worlds oldest rainforests are thousands of plant and animal species untouched by civilization. Experience the natural wonder of this region by self exploration or by guided tour. Cape Tribulation is the only place in Australia where the rainforest meets the beach and is one of the most beautiful places to ride a horse in the world. Daintree Rainforest Environmental Centre is an excellent introduction to the rainforest with a 23 metre high canopy tower - which provides an awesome view over the rainforest. Built in 1989 the Daintree Discovery Centre also features twin theatres, touch screen displays, several boardwalk trails and audio commentary on everything you see. The Dragonfly Gallery is located at Cape Tribulation and features quality arts and crafts. The walk is signposted on the main road at Cape Tribulation. The Dubuji Boardwalk is a 1.8 km interpretive boardwalk through the forest and mangroves. There are several exotic fruit orchards at Cape Tribulation where you can purchase or taste the most amazing fruit, and local restaurants and cafes produce such delights that you would be lucky to taste elsewhere. Not quite in the Daintree but just south between the rainforest and Cairns, Skyrail is one of the top tourist attractions in Australia. 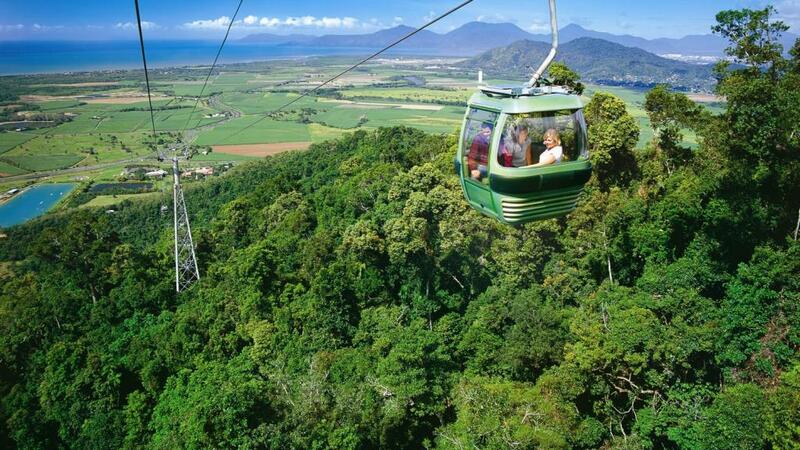 Sail over the rainforest canopy via cable car to the top of the mountain range at Kuranda. Grab a bite to eat and see an aboriginal show then ride back down the mountain on the Kuranda Scenic Railway which would have to be one of the prettiest train rides in the world. For the adventurer in you, there are many hiking trails, like the 1.1 km Marrdja Boardwalk, which are exotic and challenging at the same time.